Store Settings is where you can manage general settings for your Order Desk account. 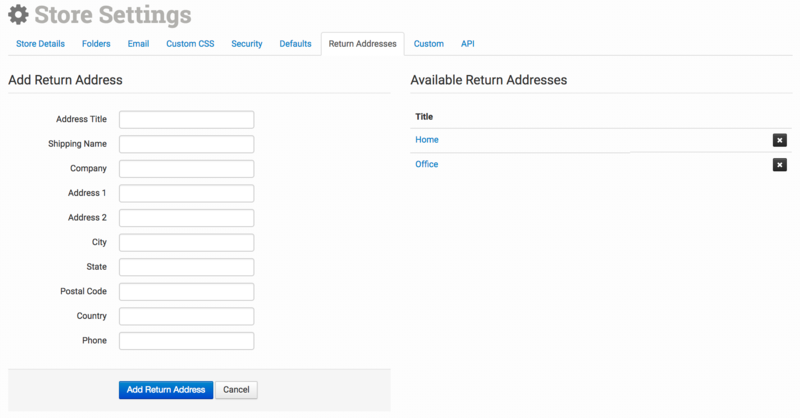 These settings include emails used for customer facing notifications as well as admin emails for communication with Order Desk, folder management for customizing where your orders are stored in the app, adding CSS to customize views, enabling certain security checks and setting up return addresses, among other settings which will be discussed in more detail in this guide. Any store user on an account with the "manage settings" permission enabled will be able to access and edit the Store Settings. For more information on store users and permissions, please see the Creating Custom Views for Store Users guide. The store name is the name used in email communication with your customers and in templates throughout the app. The store URL is an optional field to add a link to your store. 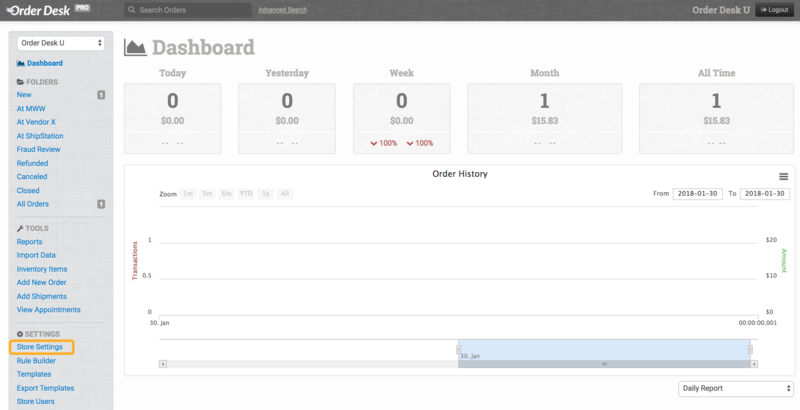 The locale setting will allows you to set the currency on your Order Desk store. Set your timezone so that your orders will be displayed with your local time offset. When the store country is properly set, orders that are domestic will not display their country code, but any international orders will. This also helps the EasyPost integration determine what is domestic and what is international for a specific store. Choose the country name format for the customer/billing and shipping country codes. 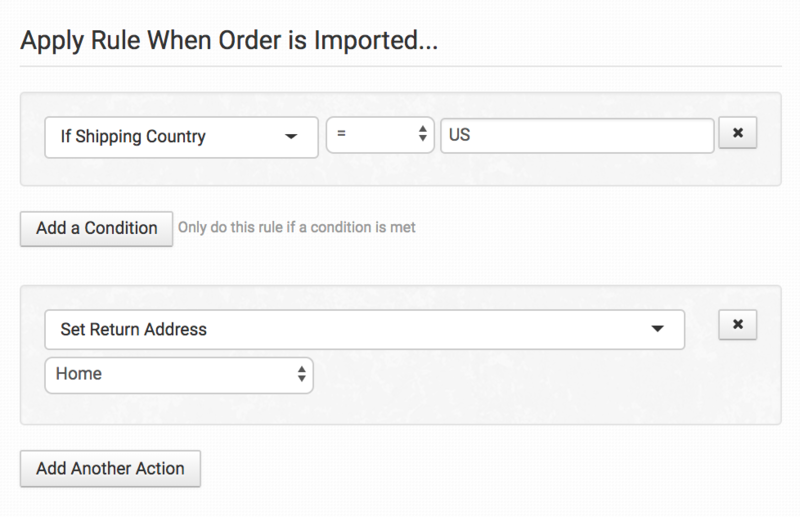 When orders are imported, the country format will convert to the setting selected here. You can choose between Abbreviation (two-letter), Full Name and Three-Letter Abbreviation. If enabled, normalize capitalization will automatically capitalize fields where lower case letters have been used. This will also affect certain abbreviations. For instance, if a company name has LLC in it, when normalize capitalization is enabled, it will automatically change it to Llc. The normalize phone numbers setting allows you to choose how phone numbers are stored with orders. Options include Do Not Change Phone Numbers, Add Parentheses and Dashes or Numbers Only. These are optimized for US-style phone numbers. There are two options for Split Method—Keep Extra Order Details or Remove Extra Order Details. When splitting an order, if you want to keep the extra details of the order (that is, if you want to keep the connection with the source of the order), select Keep Extra Order Details. This way, when split, the new order will be linked to the original order and can still communicate with the source (your shopping cart) where the order came from. The new order will share the original order ID and have -S1 appended to it, for example, #1234 and #1234-S1. 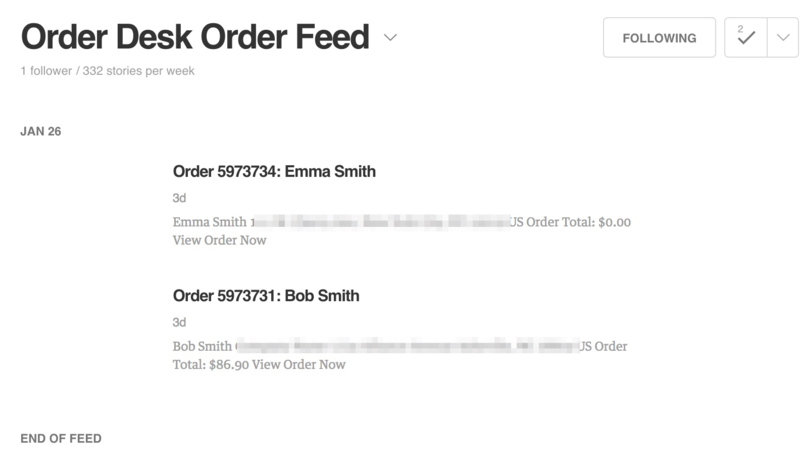 If you want your split orders to be completely separate from their source order, select Remove Extra Order Details, and they will become completely new orders with no connection to the source. If you would like to follow your store's order activity with an RSS Reader, you can get your RSS Feed here. As orders come in, your reader will display them. Every Order Desk store has a unique store ID. If Prepend Original Store ID When Transferring Orders Into This Store is enabled, any time orders are copied or moved from another Order Desk store into this store, they will have the original store ID prepended to the order number. This is especially useful for accounts that move a lot of orders between stores and need to know where they came from at a glance. It will also keep similar order numbers from colliding. For example 2154-1000 and 6548-1000 both had an order number of 1000, but because they came from different Order Desk stores, both can be added into the same store without an order number conflict. The date format uses PHP date code. For more information and the date code reference, refer to this article. The short date format is used in certain integrations to display the date, specifically Authnet, EasyPost Shipment Manager, Stripe Account Details and FBA Estimated Shipment details. When using nonstandard combinations of PHP date format codes, dates on orders can be changed to January 1, 1970 unintentionally. 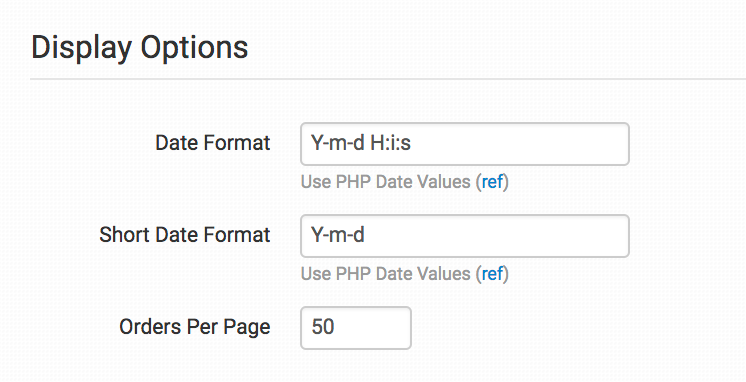 If you see this date, try a different date format or return it to the default: Y-m-d H:i:s.
The orders per page setting allows you to change how many orders you would like displayed at once on a page. The default is set to 50, which is the optimum setting for speed and performance of the app. If this number is too high, it will slow down the system. If you need to select and move a large number of orders at once, change this number to a something higher, but don't forget to set it back to a relatively small number when finished. If you want the items in your orders to sync in any extra inventory details saved in Order Desk, enable this setting. This is mandatory for print on demand stores, but may also be useful for other merchants who need to store extra item details that don't come in from the shopping cart. For more information on syncing inventory with orders, please see this guide. For information specifically about print on demand order syncing, read this guide. To reduce your inventory stock as orders are added to Order Desk, enable this Automatically Update Stock Count When Orders Added setting. This works for all orders added, whether manually created, downloaded from an integration or imported from a file. If you would like Order Desk to automatically create new inventory items out of the items on your orders, select this option. If any SKUs that aren't already saved to Order Desk come through in new orders, they will be added to your Order Desk inventory. For this to work, you must also enable the Automatically Update Stock Count When Orders Added setting. For more general information on working with inventory in Order Desk, please read our Inventory Items guide. Folders in Order Desk act as a filtering and storage system for your orders. Each Order Desk store has four default folders; New, Prepared, Closed and Canceled. Folders can be rearranged, created and deleted to fit the needs of your workflow. For more information on how folders work in Order Desk, please see the Working with Folders section of our Getting Started guide. The store email will be used as the return email address when any emails are sent to your customers or clients from Order Desk. Please see our Working with Email Templates guide for more information. The admin email address is what Order Desk uses to contact you for Order Desk notifications regarding your store. This email address is not used for any communication from you to your customers through Order Desk. For multiple addresses, separate with a comma. 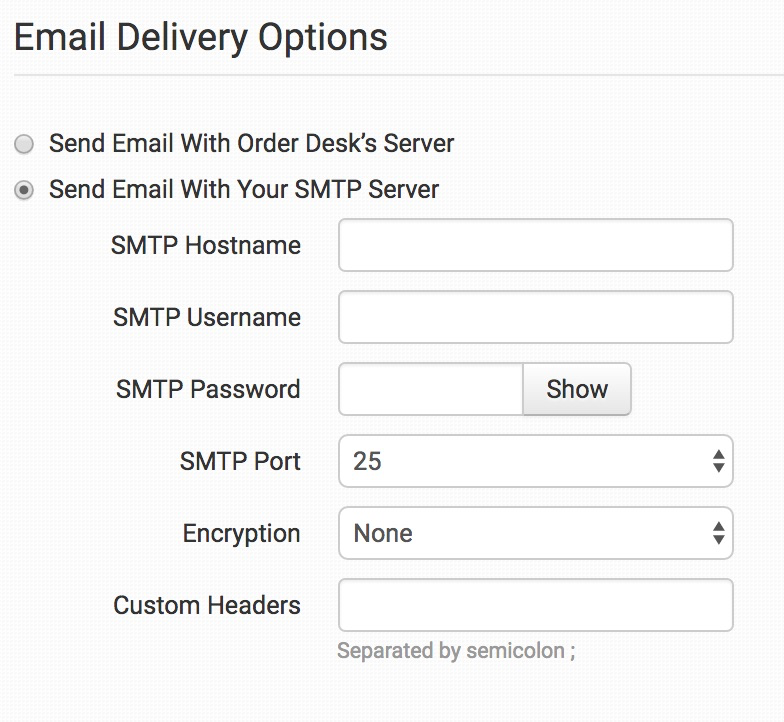 Email Delivery Options allows you to choose between sending email with Order Desk's server or with your own SMTP Server. For more information, refer to our Sending Email From Order Desk guide. 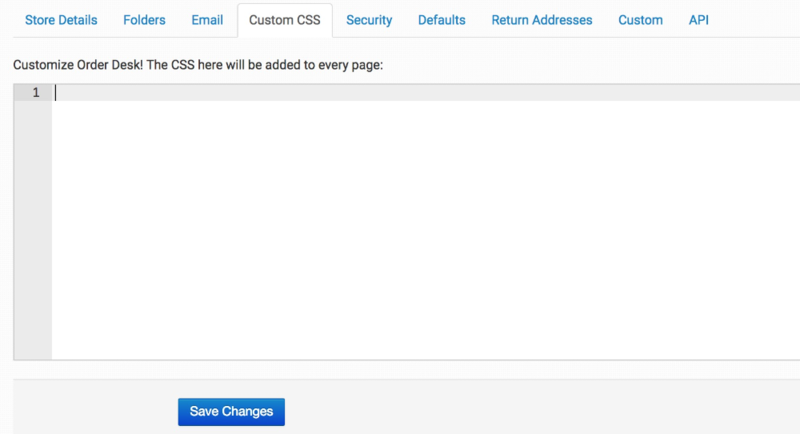 You can customize certain aspects of the app by applying your own custom CSS to the Custom CSS page. 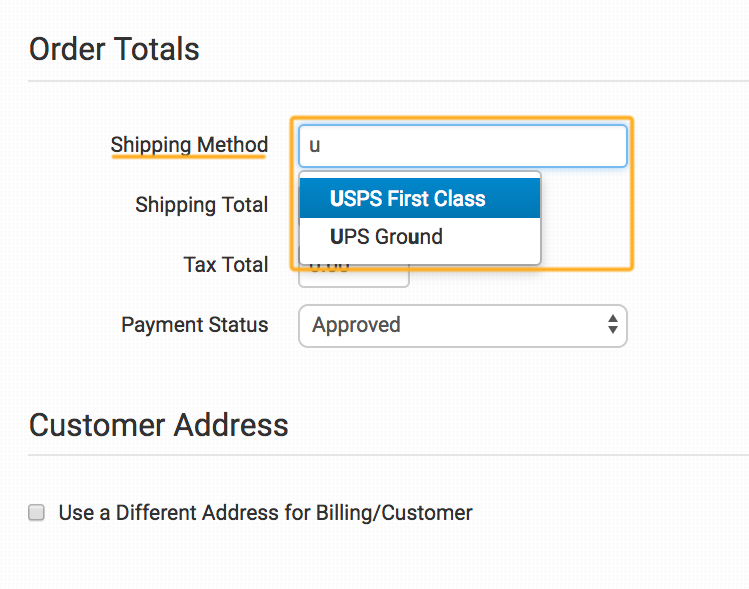 Options are to customize the interface of your account, hide certain elements from your store users, or inject CSS for the confirm page that can be sent as a field in an export template or linked from the dropship email template. When writing your CSS, target your code to the body class that can be found in the source code for the page. Please see this guide for more information on adding orders manually. Add variation names, one per line, to have them autofill when adding variations to an item in an order. 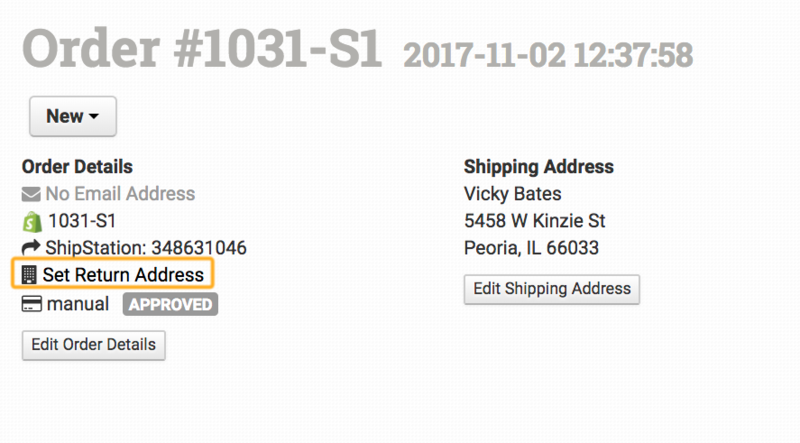 Add the return address you use for your store here. 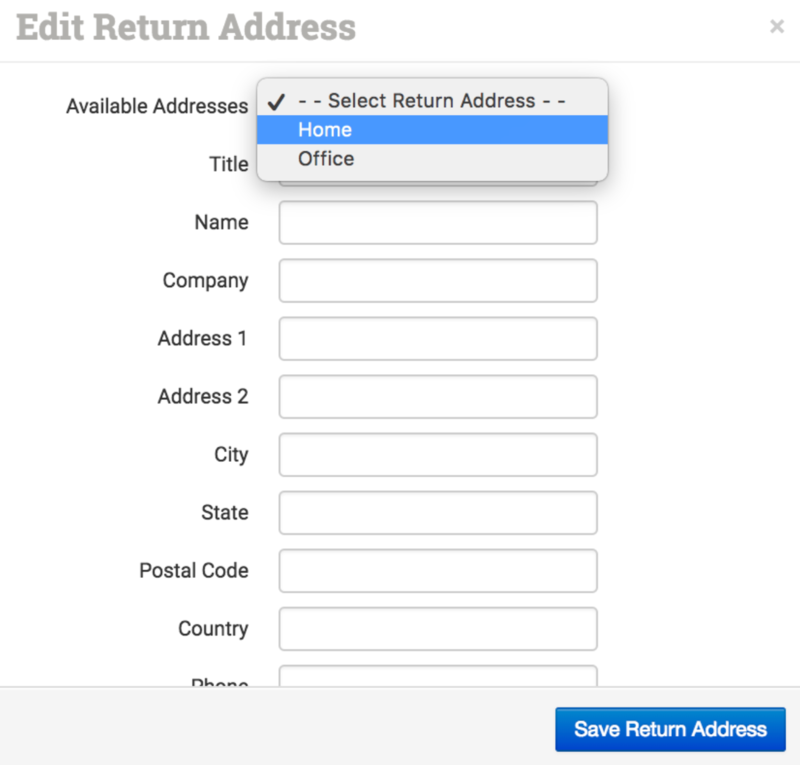 Add as many return addresses as you use, giving each a unique Address Title (Home, Office, Warehouse X, etc.). For more information on working with rules, please see our customization guide. In some cases, Order Desk support may provide you with special custom settings to implement a custom feature you need that other stores don't. In those cases, we will put the code in the box under this tab or tell you to enter it here. Your Store ID and API Key will be displayed on this page. If you plan to use the Order Desk API to send and receive data, please refer to the API Documentation here. 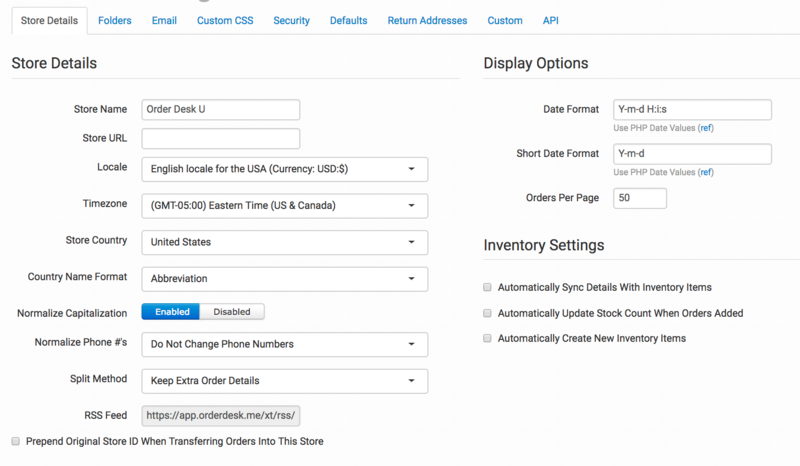 Quick Start: How Customizable is Order Desk Really?